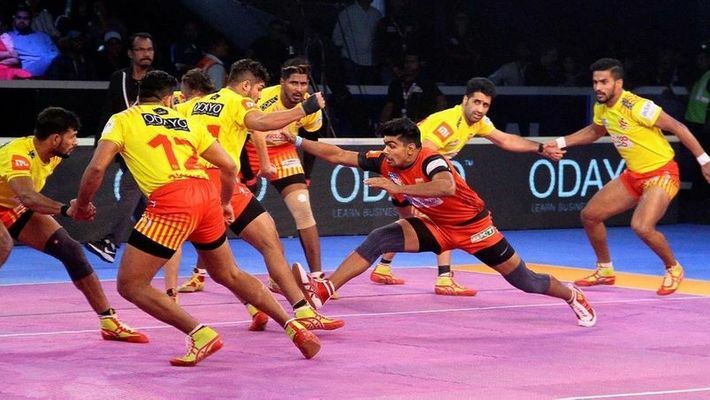 Mumbai: Raider Pawan Sehrawat starred for Bengaluru Bulls as they defeated Gujarat Fortunegiants 38-33 in a pulsating final to lift their maiden Pro Kabaddi League title in Mumbai on Saturday. Sehrawat accumulated 22 points in his 25 raids and turned the match on its head as he single-handedly took the southern outfit to a memorable win. Their second-best player was Sumit Singh (3 points). It was heartbreak for Gujarat yet again like the last season, when they ended up as runners-up. Pawan was the difference between the two teams as he pulled back his side into the game after trailing 9-16 after the first half at the NSCI Dome at Worli. A resurgent Bengaluru, courtesy Pawan's show, inflicted all-out not once but twice on the Gujarat team to move ahead and then held their nerve to come out triumphant. Earlier, Bengaluru opened their account by sending off Gujarat's star raider Sachin Tanwar in the opening minute. Gujarat's raider K Prapanjan made it 1-1 after a successful raid. After Gujarat went ahead 2-1, they brought back Sachin Tanwar. But Pawan Kumar Sehrawat attempted two successful raids to take them 3-2 ahead. In a final where every point mattered, the two teams were going neck-to-neck with 4-4, after the initial seven minutes of the match. The two teams showed amazing skills, that included super tackles and raids, and were locked at 7-7 with eight minutes to go for the completion of first half. But then Gujarat seemed to have found the momentum as they surged ahead 11-7 with a couple of successful raids and tackles. And then Gujarat inflicted an 'all-out' on their opponents to increase their lead to 15-9. At the half-way mark, Gujarat led 16-9. After the change of ends, Bengaluru, with some fine defence and tackles, made it 17-21. However, the turning point came when Sehrawat grabbed six points for his side after two successful raids which led to Gujarat's all-out as Bengaluru edged ahead 23-22, with about nine minutes before the final whistle. Bengaluru and Gujarat were tied at 29-29 at one point. Again it was Pawan, who grabbed two points for his team, to take them 31-29 ahead, with two minutes remaining for the final whistle. Again a successful raid by Pawan meant that Bengaluru inflicted another 'all-out' and surged 36-30 ahead and then ended the game at 38-33. Bengaluru went home richer by Rs 3 crore while Gujarat bagged Rs 1.80 crore as prize money. The seventh season of the Pro Kabaddi League will begin in July.